There are 3 new Grocery offers from SavingStar available from today. 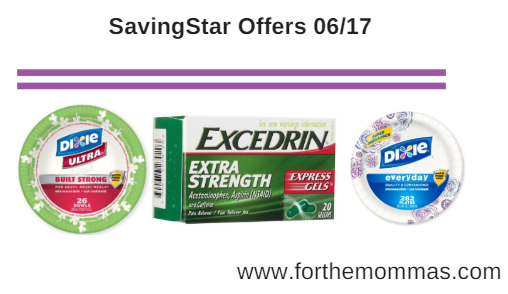 You can save on Excedrin, Dixie and more. Save $2.00 on any ONE (1) Excedrin® 20 ct. or larger..Expires 7/1/2018.Save $2.00. Save $1.50 on ANY ONE (1) Excedrin® 80ct. or larger..Expires 8/5/2018.Save $1.50. Save $1.00 on any TWO (2) packages of Dixie Ultra® or Dixie® Everyday Plates..Expires 7/17/2018.Save $1.00.